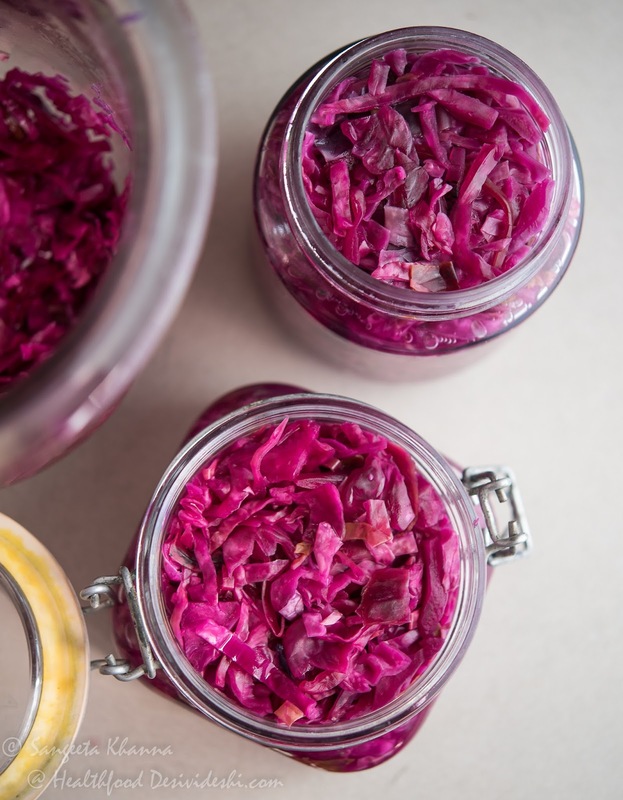 Making sauerkraut is easy although it is a bit time consuming process considering it involves a bit of work sterilizing the jar, chopping boards and the knife. 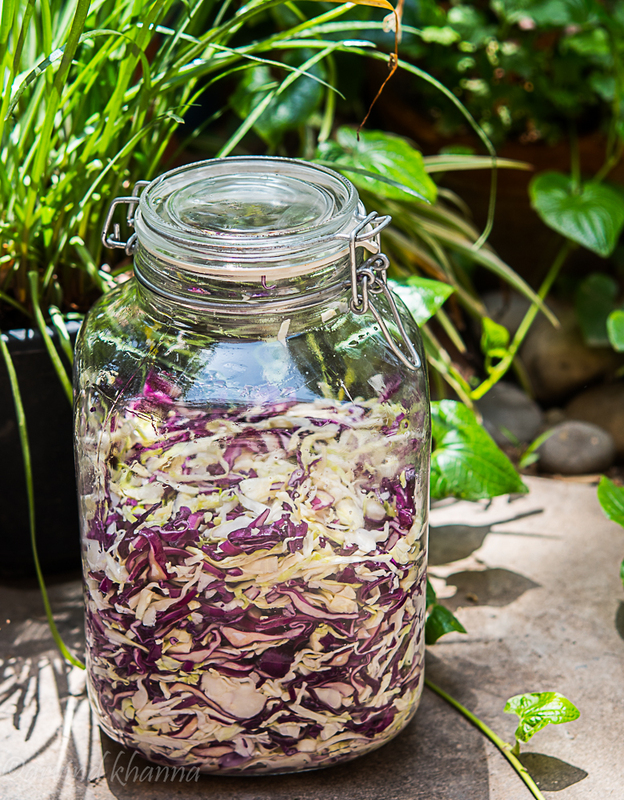 But once you have made a large batch of sauerkraut you can keep it in the fridge for a month. In fact sauerkraut keeps well for 6 months if refrigerated and one can keep adding a handful to salads and wraps or just about anything that needs a hint of tartness. In fact in the last 3 weeks when my house help has been on leave and I am managing work and house chores alone, the jar of sauerkraut in the fridge has been a savior. Not that I am not cooking more vegetables but it saves me from elaborate cooking when I need a quick fix for my meals. 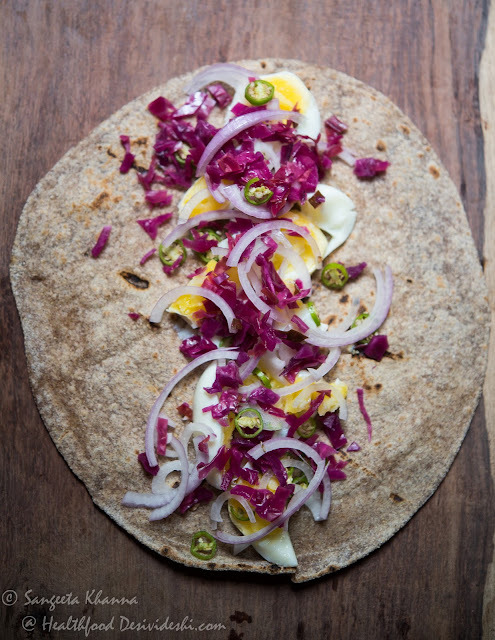 Now a days I cook ragi rotis and stuff them with chopped boiled eggs, some chopped sauerkraut, onion slices and chopped green chillies like this. Sometimes I go out in the garden and pluck any greens growing, rucola is doing fine in this summer heat so that becomes a frequent topping too. 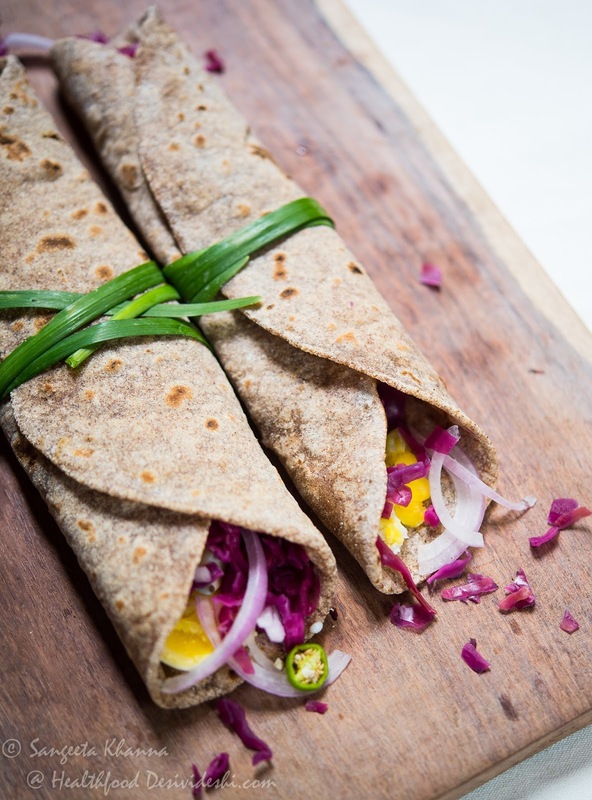 Once wrappd, this becomes a filling delicious meal for ourselves. You don't need any mayonnaise or mustard with these toppings but you can apply some butter if you want. I usually keep the eggs soft boiled so the filling stays moist and sticks together. Sauerkraut makes such wraps so easy and simple as it fills in for the sauces or complex dressing you might need. I mean even if you have all ingredients within reach you reduce one step of mixing them, hence reducing use of more utensils. I am taking about minimal cooking, minimal utensils used and mess free eating without any plates. Just pick up from the serving platter and eat. 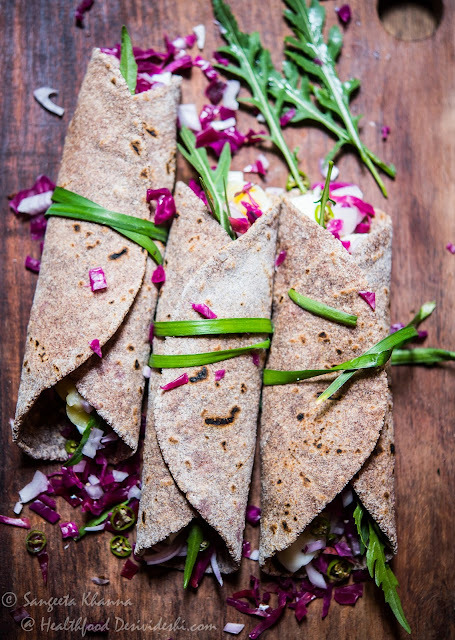 To secure the wraps you can tie them using thread or garlic chives like I did. And here is another wrap that is made with millet dosa. A mix of Amaranth flour, Barnyard millet and urad daal (black lentils) is made into a paste and is fermented overnight in Indian summer. In winters it may take 2 days to ferment. 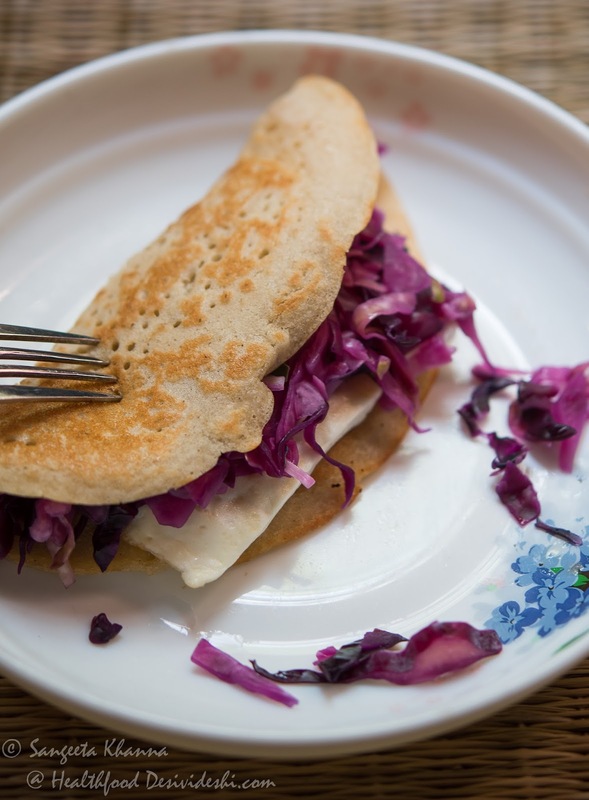 The fermented batter is seasoned and made into thin crepes (dosa), using ghee on a cast iron skillet. 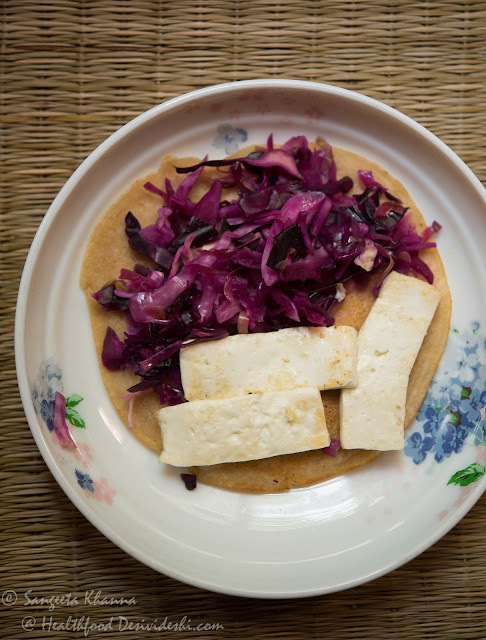 I grilled halloumi slices that a friend has sent and spread in on the dosa along with sauerkraut. You can drizzle some mustard or loads of pepper or may be some rocket but this was a quick hurried meal for us so I just chomped on this dosa wrap along with a cucumber sprout salad that was already fixed for the day. Coming to the salads, I make this raw papaya salad with some sauerkraut thrown in and we love it. 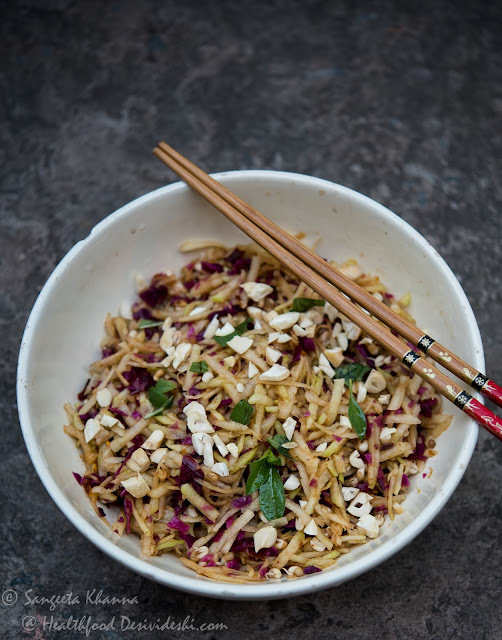 The recipe of raw papaya salad with sauerkraut is a keeper trust me. 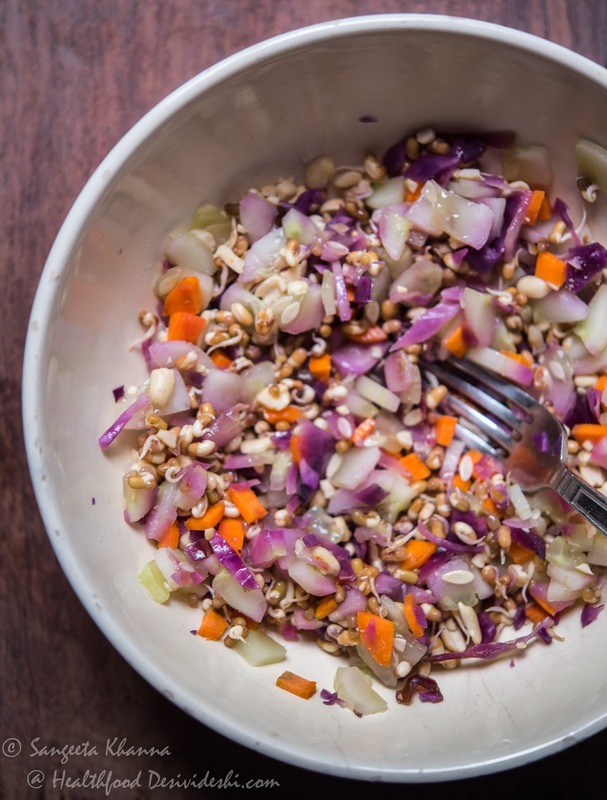 Another chopped salad that I add sauerkraut is this cucumber, carrots and sprouts salad with crushed peanuts and just pepper to season as sauerkraut has enough salt. Note that peanuts also have enough fats so an oil based dressing may be skipped. But add on the dressing if you like. 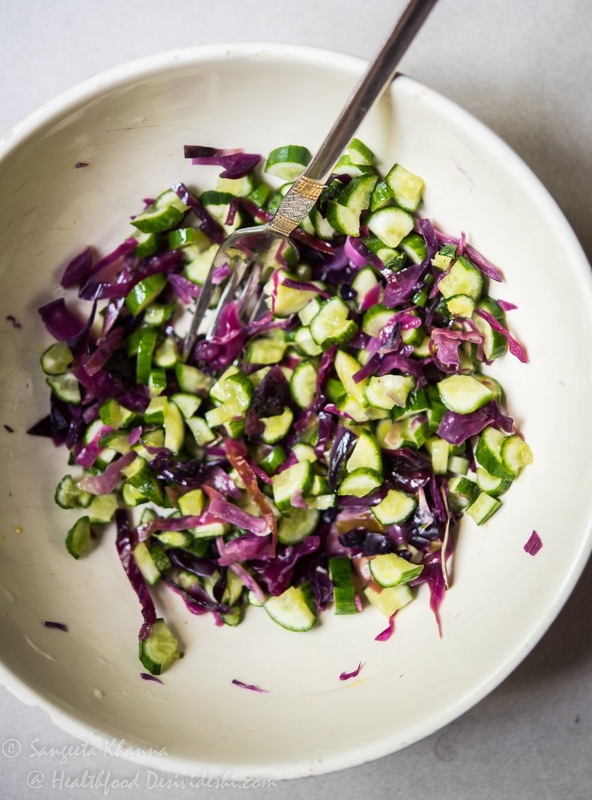 Sometime it is just cucumbers, some sauerkraut some pepper and a drizzle of mustard oil. These salads have been a regular this season as we just don't feel like eating anything warm sometimes. These salads are very hydrating for the season too. I add the chopped sauerkraut to my egg fried rice too. In this recipe for a cup of cooked rice I used 4 eggs, 3/4 cup chopped onions and scrambled it all together with chopped green chillies, salt and pepper. Then sprinkled loads of chopped sauerkraut before serving. A delicious meal for two gets ready easily this way. I have been cooking very quick meals since the last 3 weeks as my house help has been on leave. Eggs, sprouts, cucumbers, rice, paneer and dosa batter have been the essential staples I am depending on. 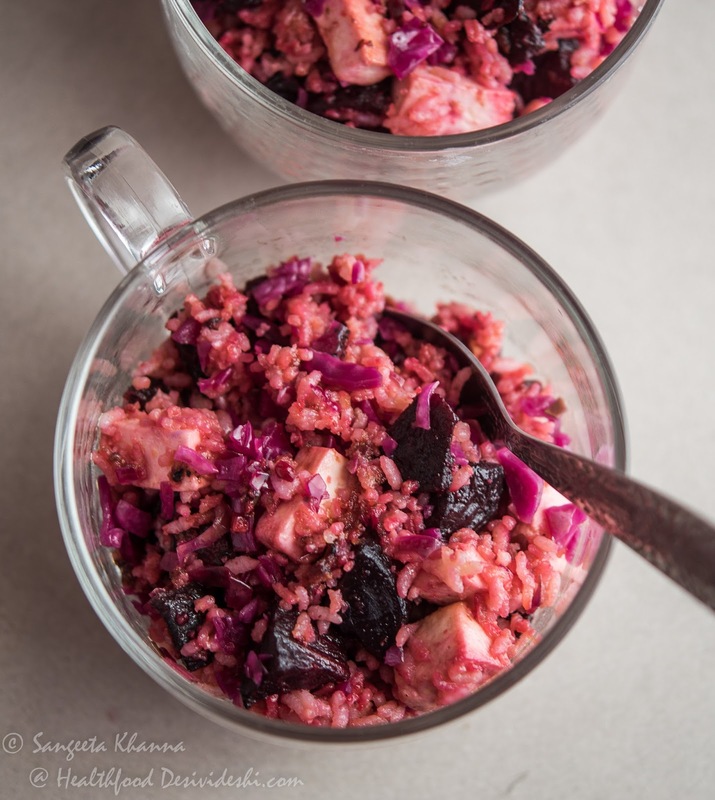 Here is another fried rice with loads of diced beets and paneer cubes. Beets were cooked with ghee and cumin red chilly tempering till soft. Loads of garlic and pepper was also added for making it spicier. Just paneer cubes were added as the beets cooked, after mixing it thoroughly cooked rice was also mixed into the pan. 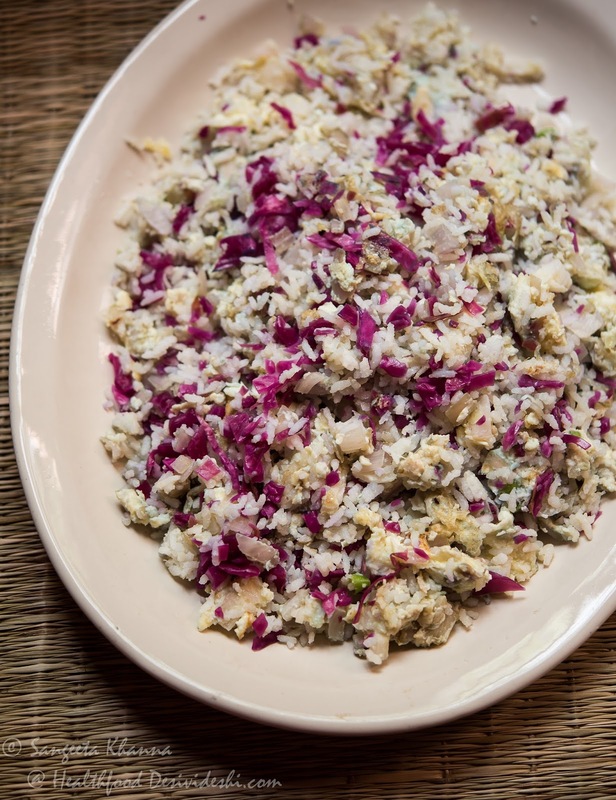 Loads of chopped sauerkraut again and it is ready to serve. The balanced one pot meal that you can enjoy warm, served in a bowl or a large mug as we did.. These are huge 700 ml capacity breakfast cups and we end up having our meals in it sometimes. As my current batch of sauerkraut is just about to finish I made another large batch and kept for fermentation. 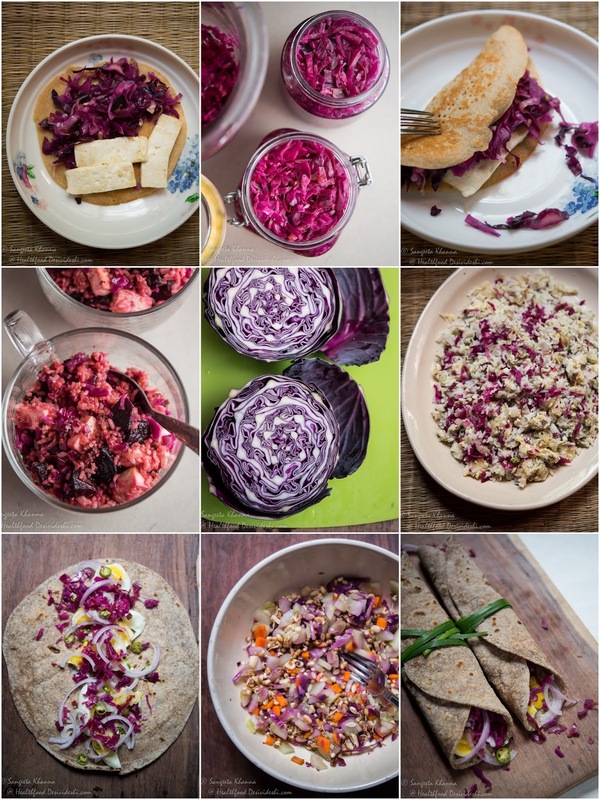 A mix of red and green cabbage takes about a week to get nice and tart. I kept it in the sun to quicken the process but otherwise I keep it on my kitchen counter to ferment. It will be bright purple when ready. I will update that picture here as soon as this huge batch is ready. The jar above is 5 L capacity and it makes a lot of sauerkraut to last me a couple of months. When are you making your own batch of sauerkraut The recipe of making sauerkraut at home is not much complicated though it is a bit of work because you need to sterilize surfaces and chopping boards, knives etc. Keeping the surface of the fermenting sauerkraut wet is also important during the whole period of fermentation. 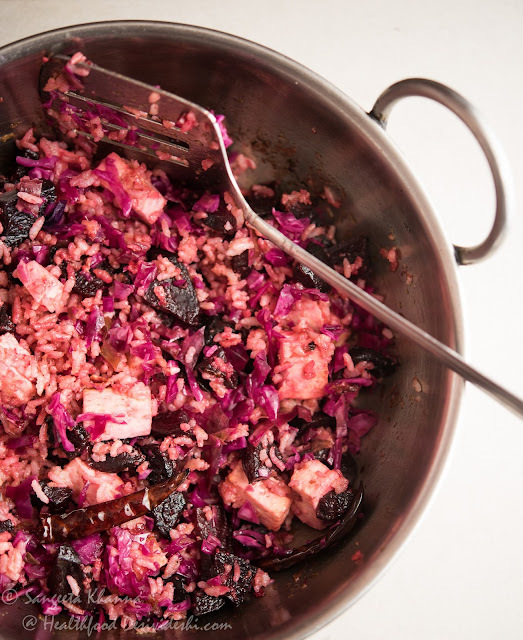 See the recipe and procedure of making sauerkraut that I have posted long back and make some for yourself. What perfect timing for this post! I have been on a d am on antibiotics and was thinking today I need to make and eat some fermented veg. This post has given me lots of ideas. Made some carrot pickle tonight and will make som sauerkraut as soon as I csn get an organic cabbage. I always thought it was gross but you have made it look too tempting! Are achar made with oil considered probiotic? I'm guessing not but don't know. Also what does your house helper think of your cooking and fermenting? Is it unusual to her or does she recognize the value of traditional foods? No the oil preserved achars are not probiotic and even if they ferment a little the probiotic benefit is not established. Don't ask about my househelp :D they don't normally like what I eat like the millet brads or rotis and all these fermented stuff but they do get inspired to eat some vegetables, some seeds (I keep asking them to include sesame being the cheapest)and some millets too sometimes. I find it nice when they start asking me what is good for their kids' health and they start making efforts to not let the kids' eat junk.